A-shares three major stock indexes rose across the board, the GEM index rose nearly 5%, and the net inflow of funds went up a record high. The three major stock indexes of A-shares surged across the board today, with the Shanghai Composite Index closing up 2.70% to close at 2674.48 points; Shenzhen Component Index rose 3.96% to close at 7786.54 points; the ChiNext Index rose 4.82% to close at 1348.28 points. The total turnover of the two cities was 451.2 billion yuan, and the industry sector rose across the board. The number of stocks falling in the two cities was less than 100. It is worth noting that the northbound funds of Shanghai-Shenzhen-Hong Kong Stock Connect continued to grab the situation today, with a net inflow of 17.9 billion yuan, a record high. After going through the ups and downs of October, I have not yet returned to God. The A-shares have already entered the pocket of “opening the door” in November. Can the “Red November” effect continue to ferment in the market? A-share "policy bottom" is coming? Looking back on October, October 19th is a day when many investors remember it. On the same day, Liu He, Vice Premier of the State Council, and the three heads of the Central Bank, the China Insurance Regulatory Commission and the China Securities Regulatory Commission collectively voiced market sentiment and boosted investor confidence. With such strong policy support, the A-share defense war has been fully upgraded. The Shanghai stock index that pushed the new round to a new low of 2,449 points in the morning, the sudden change of style in the afternoon, the big financial sector set off a daily climax, and the three major stock indexes of A-shares recovered. It is also from October 19 that the warmth of the policy has not stopped, and the signal of caring for the market has continued to be released. On October 21, the three departments of the Shanghai Stock Exchange, the Shenzhen Stock Exchange and the China Fund Industry Association linked policies. The Shanghai Stock Exchange issued a statement and actively took effective measures to fully maintain the stable and healthy development of the market; the Shenzhen Stock Exchange stated that it carefully organized and implemented the work requirements of Vice Premier Liu He on the stock market; the China Foundation said that it would solve the problem of equity pledge in participating companies' mergers and acquisitions The private equity fund provides a “green channel” for filing. On October 25, the China Banking Regulatory Commission issued the "Notice on the Relevant Matters Concerning the Establishment of Specialized Products by Insurance Asset Management Companies", allowing insurance asset management companies to set up special products, giving full play to the long-term stable investment advantages of insurance funds, and participating in the resolution of the liquidity risk of listed companies' stock pledges. To provide long-term financing support for high-quality listed companies and private enterprises to maintain the long-term healthy development of the financial market. On October 30th, the official website of the China Securities Regulatory Commission issued a statement on the reform of the capital market, accelerating the promotion of three aspects and responding to market concerns. The Ministry of Finance issued the "People's Republic of China Stamp Tax Law (Draft for Comment)" and began to publicly solicit opinions. It shows that the tax rate of the stamp duty on securities transactions remains unchanged, and it is flexible, proactive, easy to adjust to the camera, and better adapted to actual needs. The taxpayer and tax rate adjustment of the securities transaction stamp tax is decided by the State Council and reported to the Standing Committee of the National People's Congress for the record. This series of policy trends, for the A-share market, whether the "policy bottom" has bottomed out has become one of the focus of investors. As Huatai Securities said, the two banks and the two have issued policies to relieve the debt risks of private enterprises and promote the reform of the securities market. The market policy is forming. Southwest Securities also said that in combination with the current market, the policy has already been revealed, but the market as a whole is also affected by multiple factors, and its future changes will still cause disturbance to the market, which determines that the market rebound will also be a twist. The process of progress. In addition to the “policy base”, Minsheng Securities also counted the time relationship between the policy bottom and the market bottom in 2005, 2008, 2012 and 2016, and found that the policy bottom is usually about one month before the market bottom. .
Minsheng Securities further stated that usually half a year before the market bottoms out, the government will gradually introduce favorable policies for the market, and as the market declines, the policy will continue to increase. Therefore, it is difficult to define the policy, which is the most important before the bottom. The favorable policy is the symbol of the policy. However, open source securities believe that whether it is to solve the equity pledge, or to assist listed companies. The central and local areas are unprecedentedly unanimous, and it is clear that this is an invisible hand that plays a major role in the back. The bottom of the policy is the bottom of the market, and the two have already coincided. In addition, many industry insiders also pointed out that in addition to the discussion on "policy bottom" and "market bottom", the overall valuation of the stock market is close to the bottom of history, and the space for sharp decline is limited. Then the problem is coming! Is it currently the “policy bottom”, “market bottom”, “valuation bottom”, or the “emotional bottom” of the stockholders caused by the irrational decline of A shares? To this end, Eastern Fortune Network conducted a stock market survey in November to understand the views of many investors. According to the survey results, 35.6% of the investors believe that the current policy is the bottom; 5.7% of the investors said that the current A shares are at the bottom of the market; and 5.5% of the investors feel that the current valuation is the bottom; 6.9% of the investors said that the current is the bottom of the mood; There are also 7.2% of investors who are more optimistic. They think that the current four are the same; 25.9% of the investors are more pessimistic. They think that the current A shares are still in the process of bottoming, and it is still not certain what the bottom is, and 12.8% of the investors feel that they are themselves. Not sure. Can A-shares stabilize in November? After reading the overall shareholding status of the investors in October, we will speculate on the attitude of the investors to the November A-share market. 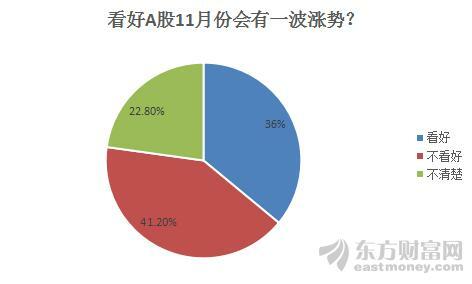 According to the survey conducted by Oriental Fortune.com, 36% of investors are optimistic about the A-share market in November, and the possibility of a wave of gains is relatively high; 41.2% of the investors said that the market may not be ideal in November, and they are not optimistic; 22.8% of the investors said they could not see the current situation of the A-shares. In November, investors have different opinions on which industry sector is optimistic about the market outlook. According to the survey of the Oriental Wealth Network, 7.3% of the investors are optimistic about the infrastructure sector; 25.2% of the investors still have high expectations for technology stocks; 16.7% of investors are bullish on big finances; and 9.6% of investors are on the resource-cycle industry More persistent; the military industry, the pharmaceutical industry, and the food and beverage industry have lower support rates of 4.5%, 6.5%, and 5.1%; and 25.1% of investors have a unique vision and prefer other stocks. 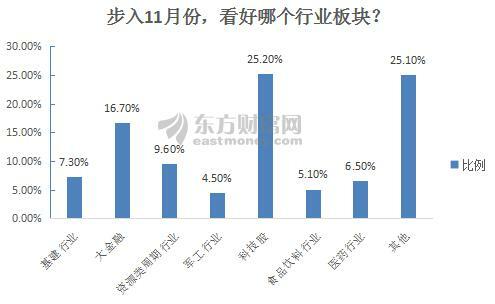 Regarding the issue of how investors will adjust their positions in November, the survey by Dongfang Fortune Network shows that 26.5% of the stockholders are firmly optimistic about the market outlook and consider bargain-hunting; 39.3% of the stockholders will rebound and lighten their positions; 34.2% of the investors said they will not move temporarily. ,Maintaining the status quo. It is not difficult for us to find that in the face of the entire October market, the stock market sentiment is more pessimistic. 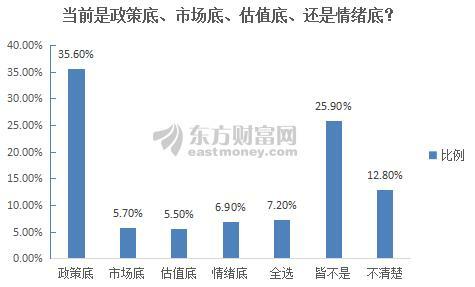 80% of the stockholders are in a state of loss, nearly 60% of the stock positions are between 80% and 100%; over 60% of the stocks of the stocks are less than 500,000 yuan. However, after experiencing the upgrade of the A-share defense war, most investors believed that it was "policy at the time." In this regard, the investor's investment confidence in November has rebounded, and the long-short view is close to a half-open state. Nearly 4 investors are optimistic about the A-share market in November, and even nearly 30% of the shareholders will choose to bargain. It is worth mentioning that, in addition to the recent strong financial sector, most investors prefer technology stocks. As Dongxing Securities said, it is currently in the post-profit period of the mobile Internet revolution. According to the technological innovation cycle, the time of the next technological revolution is about 2022. The Internet industry chain between China and the United States is the most competitive in the world, and is heavily invested in cloud computing, 5G, artificial intelligence, blockchain, AR/VR, etc. It is expected to lead the way in the next technological revolution and achieve more. Great success. A stock broke out! Ten heavy weights and good relays, the Shanghai stock index soared by 100 points in 4 days! Is the stock market spring really coming? Don't be afraid of shareholders! A shares ushered in a key switching month! The data tells you how big the probability of rising in November? The secret of precision trading is here Jedi rebound? Capital flow reveals the main action The central bank's three plans are released! What signal is revealed? The first batch of pension funds came. The rise is good, continue next week! ! It will be green next Monday. China's stock market has never been short of money. The most important thing is confidence. Improving investor confidence in investment is the top priority. I hope that today's big rise will not be a short-lived one, giving a tens of millions of people a reassurance. Individual stocks can't keep up with the market. My stock has not gone up. Where do you go? The bald head is heavy, and it’s amazing. This rises, and then rises for a few more months, I will return. My ticket has not gone up! Send a few new shares? Be careful! How fast is going up, and falling is fast.